Escaping With Fiction: GIVEAWAY: Enter to win an eBook copy of Bone Dressing by Michelle I. Brooks! GIVEAWAY: Enter to win an eBook copy of Bone Dressing by Michelle I. Brooks! 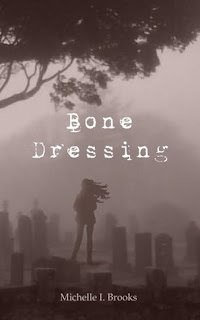 As you may have already noticed, I just recently read and reviewed a fantastic book called Bone Dressing by Michelle I. Brooks. Because Michelle is extremely awesome and nice, she is offering up one eBook copy of Bone Dressing via Smashwords coupon to one lucky winner! This is the first book in a series of 7, and her second book, Bone Dressing: The Dreaming, is due out this month. I highly recommend this series! To enter this contest, just fill out the Rafflecopter form below. To read my review of Bone Dressing, you can go HERE. To find out more about this series, you can visit Michelle's website HERE. Syd must now revisit past lives, dressing in the bodies of her previous selves … bone dressing. Her only chance to outrun the evil breathing down her neck is to face her own worst nightmares and her strongest desires. But if she can’t stay out of trouble in this life, how can she possibly fix mistakes from past lives? And just how many lives has she lived, loved and lost? What is Syd exactly, and what will she risk for the life of a man she doesn’t remember, the man she spent a lifetime with, the man she loves? Everything ... including her very own life?